As some of you may know, I travelled up to Malacca and Penang in end-October and early-November respectively with some of my colleagues. Both times were fun, and good opportunities to recharge from the daily grind of work. And of course, since I was in Malaysia, I couldn't help indulge in hauling a little bit! I hauled Elianto, a local Malaysian brand that's cheaper in Malaysia than in Singapore. If you read the marketing schtick of Elianto, the brand claims it's a Korean-Malaysian brand, but I think that's really just marketing spiel, because in general Korean and Japanese brands tend to sell better than other local Asian brands (e.g. Taiwanese, Hong Kong, etc). Thus, some local brands try to portray themselves as being Japanese or Korean-like, in an attempt to latch onto the cachet of such brands. In fact, if you go to Korea, I doubt you'll find Elianto - the last time I went there (although it was a couple of years ago, to be sure), the brand wasn't even available there. But regardless of their marketing (are they Korean? Malaysian? Malaysian but made in Korea? Vice versa? If you google it, you'll see everyone's confused, and some consumers are feeling scammed over the "you're not really Korean" thing), Elianto does have some very nice products, and they are very cheap too. So, I bought a few items. I just couldn't help it! Anyway, let's take a look at the haul up close. The nail polishes were good...I bought one first, went home and tested it out, and realized that it had a really great brush and great texture. Not too thin or thick, and opaque in two coats. Awesome. So I bought another one. I bought Burnt Umber, a gorgeous brown-red with green glitter, and I hope it has a green flash too, but we'll have to wait til I try it out. 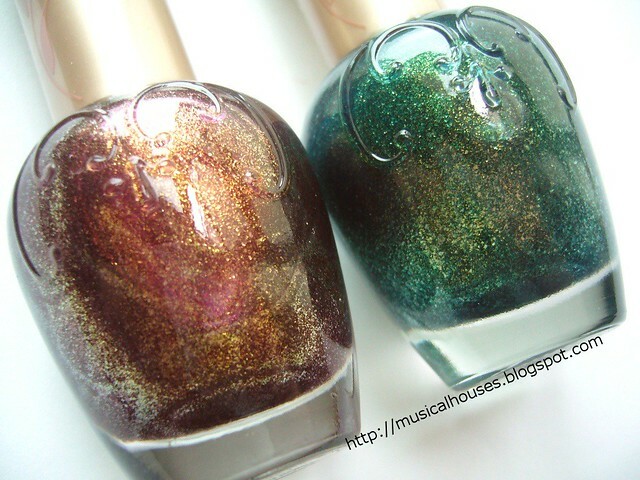 It reminds me of MAC's Club eyeshadow, but in nail polish form. I also got Racing Green, a forest green with light green glitter. Also a standout of the line, if you ask me. Next, for eyeshadows! 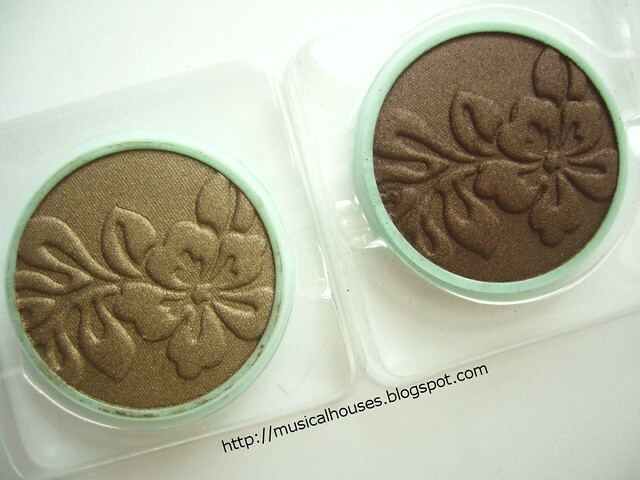 As with all brands, some of the Elianto eyeshadows were hits, and some were misses. However, both of these were fantastic - great pigment payoff, great texture, and great finish. They're also generously-sized, with pans that are bigger than MAC but smaller than Stila. I bought Taupe, which is NOT TAUPE but a nice medium-deep olive green-brown shade...very nice and neutral, and universally flattering too! I also bought Toffee Brown, which is a deep brown with neutral undertones. I hadn't realized that these didn't come with their own containers. Apparently you're supposed to buy a palette and stick these in the palette. I guess I'll just my Stila palettes instead. Oops. 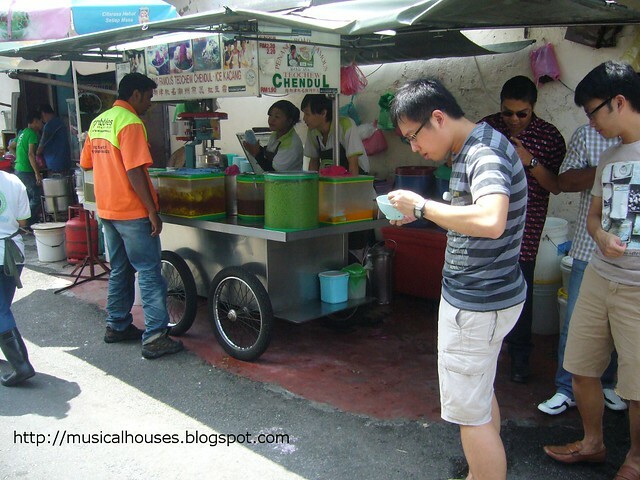 First, a chendol stall! 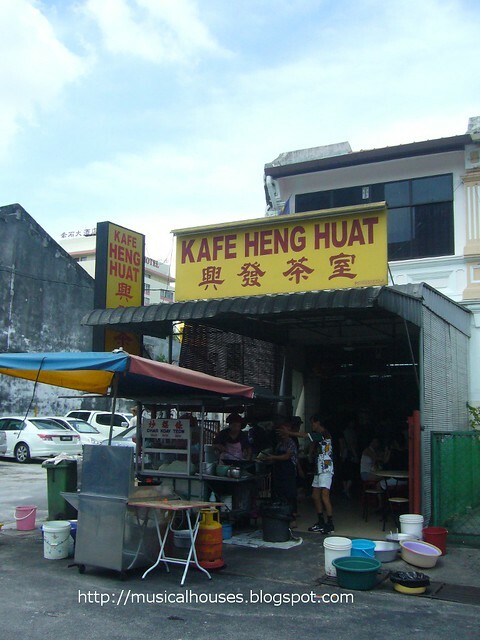 Penang is famous for its food, among other things, and we spent a lot of our time hunting down some of the more famous foods there. One of them was the chendol (feel free to google any unfamiliar food names if you're not from this part of Asia). There are quite a few roadside stalls in Penang selling chendol, and I don't think we ever figured out which one was supposed to be good..we just kind of ate randomly from a couple of stalls. Here's a typical roadside stall, with a customer (my colleague) eating in front of the stall. Now that's what you call alfresco dining! 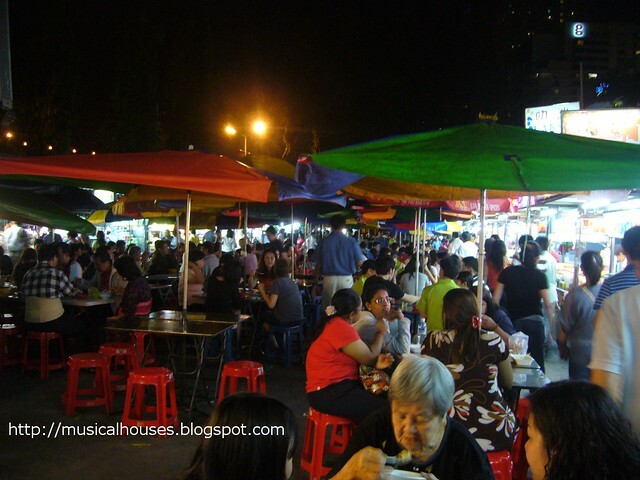 Then, outdoor food markets! I honestly can't remember where this is, but apparently it's one of the more famous and thus touristy ones. This one came recommended by some friends, which is why we went to it, but the food wasn't that great. It sure was crowded though. A close-up of some raw food hanging from a stall in the food market. It looks gross, but all that's gonna be turned into delicious food! Yummy! Yet another roadside food stall. This one is higher-class though, you actually get to sit in the shade to eat your food. The carrot cake (once again, google if you're not from this area of the world - it's not quite a "cake" in the Western sense of hte word) from this stall is apparently quite famous, and it was pretty good. It's also not cheap by Penang standards - about RM7 for a smaller-than-usual plate of carrot cake. But I really liked it, and thought it was worth the cost and the trouble to walk there under the hot sun. And some sightseeing, and possibly a very interesting spot to visit if you're into architecture - the Cheong Fatt Tze Mansion. 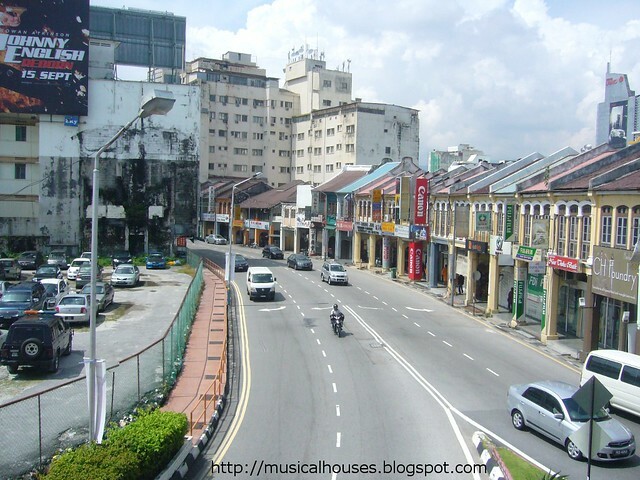 This was built by a trader named Cheong Fatt Tze, who lived in the late 1800s to early 1900s. He was quite rich, so the house was very ornately built, and very big too. In fact, the servants lived across the road in specially built apartments for them, so this house was just all family members. 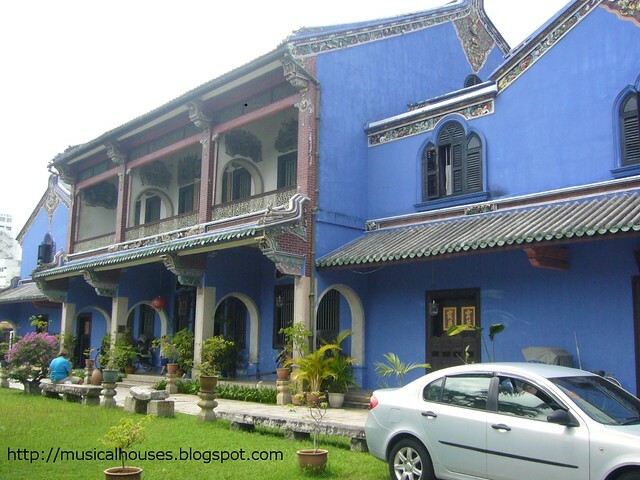 Unfortunately, fate can be cruel, and the family's fortunes went downhill after the Second World War, and the mansion was eventually sold off, and now is owned by a group of local Penang people who wished to preserve it. Anyway, this was a long post, thanks to the photos, so I hope you enjoyed it! I only put up photos from Penang, because I was too lazy to go through my Malacca ones to upload, and I didn't want the post to be too long. Anyway, my only regret was that I didn't buy more Elianto items, but the next time I'm in Malaysia, I'll definitely be keeping an eye out for those! What a great trip! I'd love to visit! 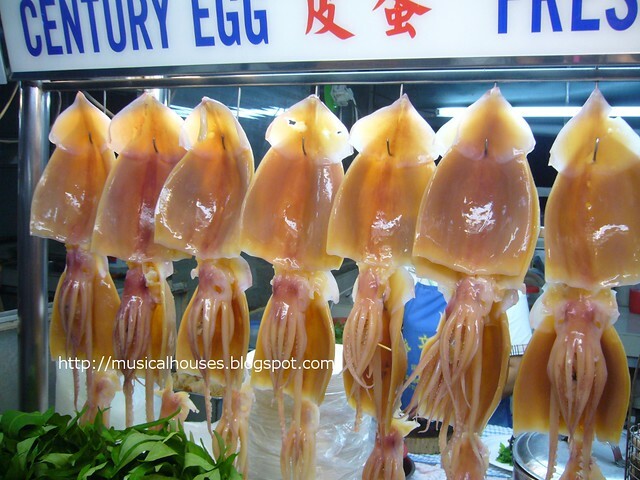 BTW, I love cuttlefish! Great haul. @Anonymous: Oops, you're right. I think it is Cheong Fatt Tze. There was a typo there!